Collaboration beers. This seems to be one of the hot topics in American craft beer over the past few years, continuing to gain momentum. I don’t even know if it has hit it’s ceiling yet. It seems, at least on the surface, that some of the brewers I have talked to are stoked about doing these collaborations. It seems to help a small brewery when they hook up with a larger craft brewer and/or one that has a good reputation. I can see their reason for excitement. My level of excitement, as a consumer, is limited at best. I haven’t had to many collaboration beers that have made the senses happy. There has been one exception: the couple that have involved Stone Brewing Company. 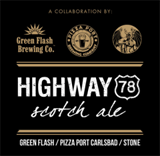 Highway 78 Scotch Ale is the second of the collaboration beers I have had from Stone. I have to say I was impressed. At 8.8% this isn’t a light beer but it is damn tasty and easy to drink. At this point Highway 78 is my favorite collaboration beer my taste buds have had the pleasure to savor. Enjoy! Useless Fact: Robert Todd Lincoln, son of Abraham Lincoln, was present at the assassinations of three presidents: his father’s, President Garfield’s, and President McKinley’s. After the last shooting, he refused ever to attend a state affair again. This entry was posted on Thursday, November 3rd, 2011 at 2:00 am	and is filed under 365 Days of American Craft Beer, Beer. You can follow any responses to this entry through the RSS 2.0 feed. Both comments and pings are currently closed.